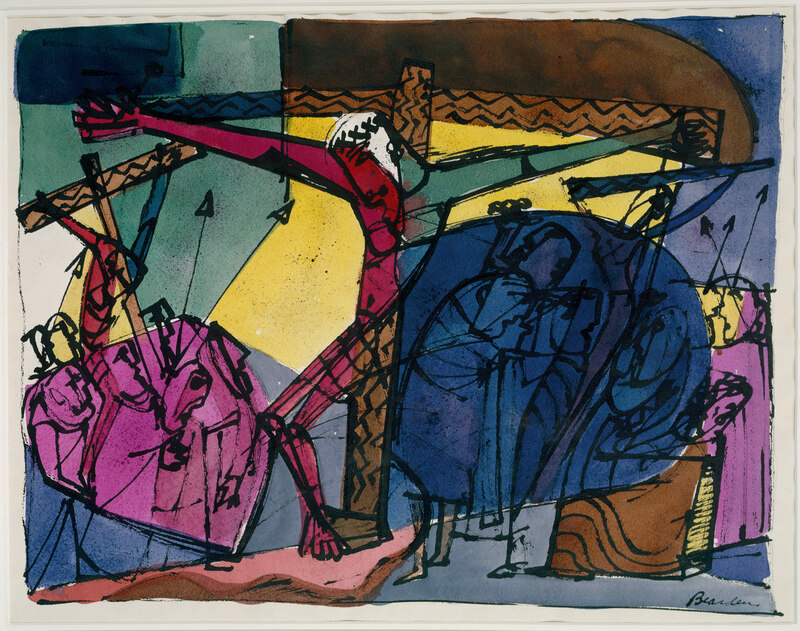 In Golgotha, Romare Bearden depicted Jesus’ body as angular and broken, burdened with the weight of suffering. There is a heaviness to the painting, in the angry faces and spears pointed at Jesus, and also a joyfulness, communicated in the artist’s use of bright pinks and yellows. Even in the midst of death, there is a hint that something new is happening. An African American artist working during the time of the Harlem Renaissance, Bearden was inspired by a modern art style called Cubism as well as the rhythms of jazz and African art. Having experienced racism growing up in the American South, Bearden would have identified Jesus’ suffering with the history of his own people, and also seen hope for redemption in his victory over oppression. Spend a few moments identifying and naming some of the “thirsts” or longings that reside in you. Write them down or simply hold them in your thoughts in the presence of God. Reflect on Jesus’ thirst on the cross. What would Jesus have thirsted for? What deeper thirst in you did Jesus come to satisfy through his suffering on the cross? As Jesus surrendered his body on the cross, in what way might God be inviting you to surrender your thirsting and longing in exchange for his gift of living water? Gracious Lord, I surrender my longing and seeking for things that cannot satisfy. Grant that I may receive from you a spring of living water welling up to eternal life. And by your life given on the cross, may your peace, love, and joy overflow in me for the sake of others. In the name of Jesus, my rock and my fountain, I pray. Amen.